To order a printed copy of the Wendy Wu Tours - China brochure, simply click the Request button below. You can download the Wendy Wu Tours - China Brochure instantly as a digital iBrochure [?]. View the Wendy Wu Tours - China Online Brochure Now! Wendy Wu Tours focus on your experience; your accommodation, flights, meals, touring, award-winning guides and transport are all included in the price, meaning that all you need to focus on is soaking up the unique sights and local culture. And trust us when we say, that there really is a lot to see in China! A comprehensive range of tours are available; from those looking to tick off the ultimate must-see attractions including the mighty Great Wall, the ancient Terracotta Warriors and of course, the adorable Giant Pandas to those seeking a deeper cultural experience in China's lesser-visited, untouched regions - it's all possible. Plus, stopovers can also be added at the beginning or end of your holiday, so if the bustling city of Hong Kong or Dubai's beaches appeal, it can all be added into your holiday. 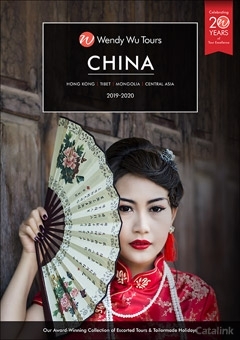 Wendy Wu Tours - China Brochure Chantelle Rona C. said: Really makes me want to go! Wendy Wu Tours - China Brochure AVE B. said: Would love to go! Wendy Wu Tours - China Brochure Beth H. said: Well presented. Wendy Wu Tours - China Brochure CHRISTINE H. said: Its on my bucket list! Wendy Wu Tours - China Brochure Mrs W. said: This book, is great if you can afford this type of holiday? By pressing the Request Printed Brochure button you give consent to Wendy Wu Tours - China (and their Data Processors for the specific purpose of delivering your literature) to send you their Brochure .